Living in the country as I do, I tend to romanticize urban living with its easy access to museums and operas, vast public libraries and arenas, enormous used book stores and public transportation. I constantly find myself looking out my window longing to replace the endless rows of pines with skyscrapers. 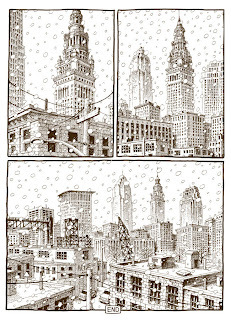 Harvey Pekar romanticized the city too, and his latest posthumous release, Harvey Pekar's Cleveland, is a love letter to his hometown that is as much a reflection of Harvey as it is of the history of the Cleveland, Ohio itself. In the postscript of this book, Jimi Izrael writes, “Cleveland's a tough, slightly bowed, achy, gray, crotchety, charitable town with moments of brilliance and unexpected, often ironic laughter. Like Harvey.” As Harvey hammers through the history of his beloved Cleveland in his imitable tight didactic style, he also tells his own story, and it is in this intersection that you find the heart of this book. 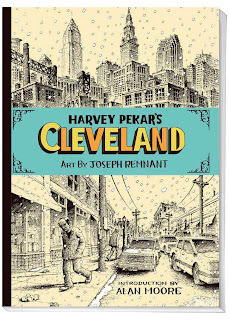 Sure, Pekar has told his stories before, but here, in the context of Cleveland's story, they somehow take on new resonance, new meaning, as if without the backdrop of Cleveland itself, there never could have been a Harvey Pekar. From his telling of it, his life seems to have mirrored that of his city, with all its ups and downs. The book begins with Harvey reminiscing about listening to the 1949 Cleveland Indian's World Series victory through the PA system in his 4th grade classroom. This leads to a roundabout summation of the history of Cleveland, as told through Pekar's clear voice. Much like the research he did into Yiddish literature in his other recent posthumous release, Yiddishkeit: Jewish Vernacular and The New Land http://www.comicsbulletin.com/main/reviews/yiddishkeit-jewish-vernacular-and-new-land, here Pekar's research on Cleveland's history is exhaustive. 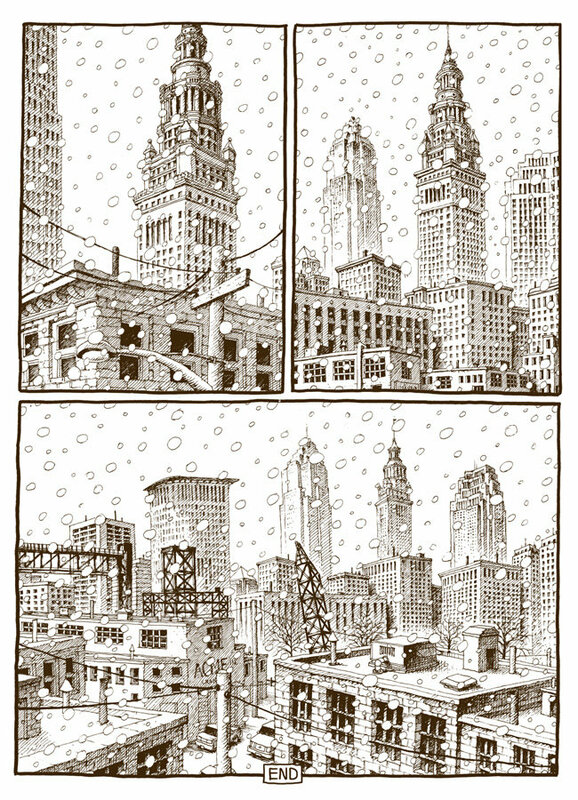 Joseph Remnant's art is also up to the task of capturing Cleveland as Pekar presents it. Of Joesph Remnant, in his introduction to Harvey Pekar's Cleveland, Alan Moore (yes, THAT Alan Moore) calls Remnant “perhaps the most sensitively-tuned collaborator on Harvey's already-stellar roster,” and I couldn't agree more. Remnant's art really adds another layer to what Pekar writes in this book. It seems like Remnant understood that as Harvey talked about Cleveland, he was also talking about himself. Remnant is able to somehow suffuse his art with this sensibility in such a subtle way that it blends the ideas of the two narratives together seamlessly. Towards the end of the book, Harvey starts examining his life currently while he was writing this. There are moments in this part that take on a much greater meaning in the wake of his passing. He writes things like “Maybe I'll keep going for awhile.” as he stares into a mirror and talks about being 70. He talks about his daily routine of watering his wife's garden and drinking milk for breakfast, and then says things like “Who knows what surprises await me?” There is such hope in these asides that, given Harvey's death, they add an unintended poignancy to the whole book. Say what you will about Pekar's curmudgeonly public persona, his books always carried with them a certain optimism and hope for the future, and that is why they will endure. Izrael also says of Harvey that he was a “painfully ordinary guy.” I think this was never so much on display as it is in Harvey Pekar's Cleveland. Ultimately this is a story about embracing change, something its author did over and over again. 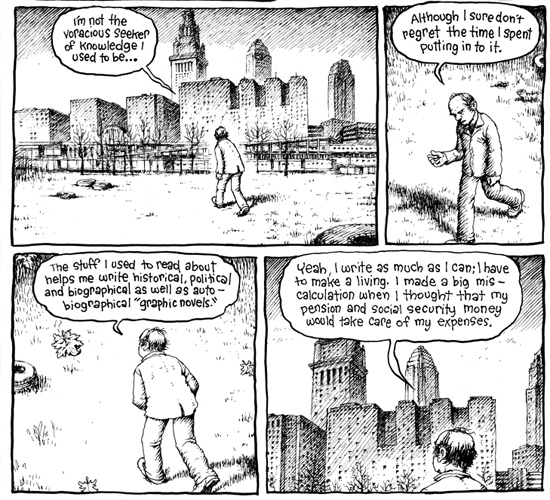 You don't have to necessarily be a Harvey Pekar fan to enjoy Harvey Pekar's Cleveland. Hell, you don't even have to necessarily be interested in Cleveland (although, really, who ISN'T interested in Cleveland?) to find something to love in this book. I think you just have to be human, and that was something that Harvey Pekar was especially good at. 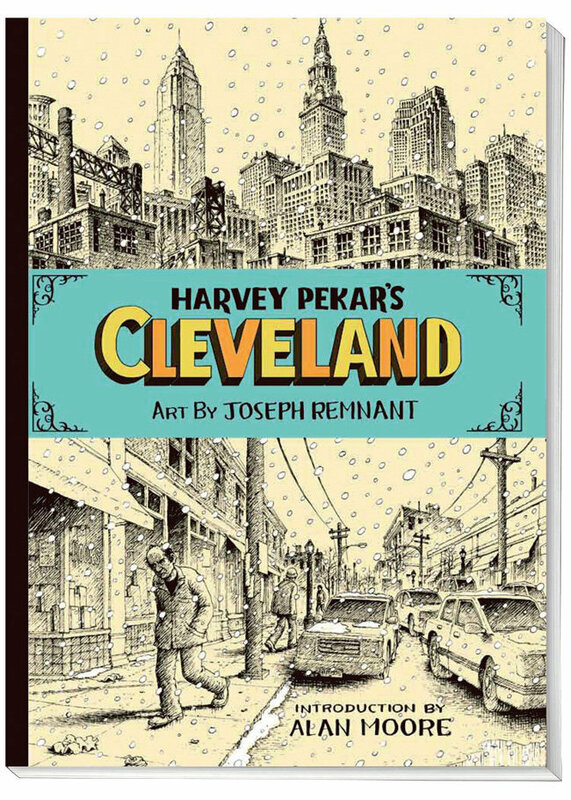 Harvey Pekar's Cleveland is a wonderful, informative, human, and bittersweet book that belongs on your bookshelf. It is scheduled to be released at the end of March.